"It's my wife who does the work," says Commissioner Maigret. "Myself, I don't do much." But he writes five or six novels a year. 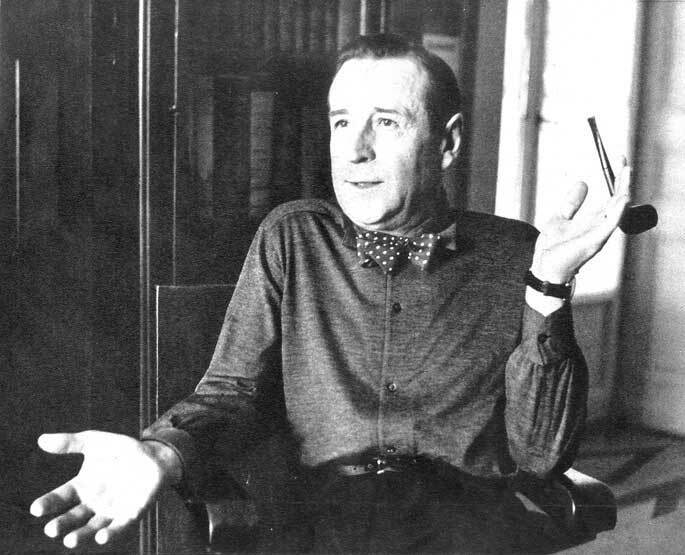 GEORGES SIMENON, alias Commissioner Maigret, leads the life of the château: "When someone asks me my profession," he says, "I answer readily that I am a man of means, because I only write for about sixty days per year  that is to say, five or six novels  and the rest of the time... well, I don't do much of anything!" It was in a château close to Lausanne, in Switzerland, where he settled with his wife Denise and his children, that we met this "man of means" who is one of the most prolific writers of the century. The old house seems to suit him: the spiral stone staircase, steps worn with time, the four towers that flank the château... all this recalls novels in which Commissioner Maigret has 'mysteries' to solve. The big rooms, on the other hand, bright and cheerful, seem made to order for Georges Simenon, the man before us, without secrets or dark problems, but carrying in his heart the mark of a true writer: the deeply human understanding of life that is made, according to his writings, with a little humor, but with a little drama too! "I finished my last novel two days ago," Georges Simenon tells us, debonair and happy, when we arrive at the château of Echandens, set right in the middle of the village, surrounded by small hills. On a calendar pinned up close to his office, two and a half weeks are marked off, indicating the time destined for the composition of this last novel: nine days to write it (blue pencil), four days for proofreading (red pencil). Commissioner Maigret, the central character of Georges Simenon's detective novels, isn't in this one. "For about ten years, I didn't write any more detective novels, but only "very short novels." The public often worried about it, and in pressing letters asked for news of the commissioner and his dear wife. So I had to relent, and now must provide at least a Maigret per year. I write them to relax, usually around the holidays, when I am occupied with preparations of gifts for the children, or in August, when our friends visit for the vacation season." Is Commissioner Maigret, the hero of his detective novels, to be identified with Georges Simenon, as some believe, or does Maigret live his own personal life? "He created an independent life for himself," confesses Georges Simenon, who explains, "If I bring a new element into his life, if by chance I assign him a reaction a little out of character, I risk receiving an avalanche of letters of reader reproaches!" Yet even as Georges Simenon says it, we can't help thinking of Maigret as his alter ego, so much does he strangely resemble his "friend," with his sparkling, mischievous eyes, the pipe in the corner of his mouth, his sporty appearance, like a civil servant on vacation: a dark blue shirt whose respectability is guaranteed by a red bow tie with white polka dots! 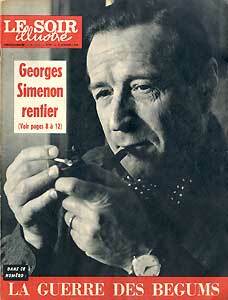 So in the end, if we like Commissioner Maigret so much, isn't it because of Georges Simenon? Let's look at the writer's career. At the age of six, in his native Liège, Georges Simenon first became acquainted with literature: "My father was an insurance agent. To supplement the family's income, my mother ran a family pension and took in students who came to Liège to study at the large College of Mining. These students arrived from various countries, and I remember that even at that time, the Poles and Russians refused to talk to each other! There were rich papa's boys, and humble sons of workers. Among these last, the most deserving were certainly the Russians who, though very poor, often miserable, found great joy in discussing for hours the literary works of their country. As their interminable discussions were exclusively in French, I understood them, and thus discovered the Russian novel." At the age of twelve, young Georges made the irrevocable decision to become a writer. "I thought that I couldn't earn any money through literature, and seriously considered taking up another profession on the side. My parents wanted me to become a civil servant, because of the retirement pension! Myself, I thought of becoming a priest or an officer." Why priest or officer? His small gray eyes sparkle as Simenon, visibly happy to have to recover the spirit of his youth, responds: "I was persuaded, at the age of twelve, that those professions left you a lot of free time. And don't forget that I needed a lot to become a writer! But, at fourteen, a young girl  though older than me, it's true  revealed to me that I had no calling for the priesthood... and at sixteen, I abandoned any idea of becoming an officer..." It was at this age that Georges Simenon revised the first of his convictions, that it would be impossible to earn a living with his pen. He thus assured himself a brilliant professional future... and with considerable income, to judge by his lifestyle! He started in journalism in Liège: "We were only three reporters on the paper. At that time, there was no specialization, so sometimes on the same day I might have to write up the minor crime reports, as well as do something important, like an interview with Clemenceau, for example. It was a great school!" Georges Simenon, lord of the manor today, doesn't seem to have any regrets over what fate had reserved for the young journalist that he was in his beginnings. He adds, "Have you noticed how everything is changed now? Everybody wants to be a writer! I can't meet anyone who hasn't written a novel! It seems to me like someone starting to compose a symphony because he's good at singing in the shower! In my case, at any rate, it took 30 years of apprenticeship!" At 19½, the teenager took off for Paris. But Simenon doesn't seem to have ever known the thirst for too-hazardous adventure, and was content to be a modest secretary for a "passingly famous" writer. What was his work? Simenon answers, "I was something of an office boy, in spite of my secretary's title, since my work was limited to affixing stamps, doing the shopping, etc." But it was there that the young man made the acquaintance of the Marquis de Tracy, a wealthy propertied owner of domains in Italy and France, very refined and educated. "For two years I was his private secretary. It was a rich period of education for me, because I could learn about many things that my situation until then had kept me from." "During that time," says the writer, "I also began to write stories for newspapers, racy ones and humorous ones... and until I was 20, I thought I was a humorist!" Hasn't he remained one beyond that age? Isn't life, reality as it presents itself daily, and as he represents it in his novels, often comical? "English critics maintain indeed that I have a sense of humor," Simenon is visibly happy to report. After the "exercises," the stories, which had become profitable besides, came the popular novels. Georges Simenon produced one every three days. "Adventure novels for boys, love novels for girls," says the writer. It was the time when Maurice Dekobra launched a genre considered literary, but which sold as well as what was called popular. "Today, the popular novel as it was then hardly exists. What has replaced it? Let's say that in many cases, literature has gone down a notch, while the level of popular writing has improved, so that sometimes we confuse the genres." For a year, Georges Simenon produced popular novels at this astonishing pace. Then, estimating that the exercise had lasted enough, he wrote his first Maigret. "When I took it to old Fayard, the famous publisher, the welcome was rather glacial! Fayard strongly doubted that my novel would meet with any success, since, he said, as a would-be detective story, it departed from the genre: no clear-cut good guys and bad guys, no happy ending, nor a quantity of other requirements. Six months later, very happy, he announced to me however that the novel, accepted simply as a kindness, had proved to be a big success." Maigret there began a fine career. Simenon shows us his house. The ground floor serves for work. There is Mme Simenon's spacious and elegant office, her secretary's, and that of her husband. Here are spread out the famous pipes, scattered almost everywhere, to be always within reach of his hand... here the famous typewriter, the famous goblet containing pencils... since everything that touches the work of Simenon is henceforth "famous". In a side room attached to his office, he says, "This is my store," and the high shelves are filled with Simenon volumes, in all the languages of the world. We go up to the second floor. "This is the domain of shared life  the living room, the children's playroom, the kitchen, the dining room." An admirable living room, made to suit Simenon's good taste and simplicity, joie de vivre and balance. A large picture on the wall: "Vlaminck brought me this picture he painted, and said it was my portrait!" And on the canvas, in a shadow that envelops everything in mystery, we see an evening newspaper, a stoneware bottle marked "poison", a revolver, and the famous pipe. We visit the dining room and find the children eating lunch under the watchful eye of the nurse. Johnny, eight, a schoolboy in Lausanne, tan and hardy, has his father's sparkling eyes. Marie-Georges, whom they call Marie-Geo, is blond, and her dreamy eyes often flash with the lightning of mischief. Their father asks the children how they spent the morning. Johnny answers with the satisfaction of one who fulfills his obligation, "We tended the cattle! ", and the Swiss countryside which spreads outside the windows seems suddenly, in spite it being fall, as cheerful as the child's eyes. I ask if he is happy at school. "As things are, not very!" he answers. But his father adds proudly, "He's the top of his class again." There begins a very closely argued conversation between Georges and Johnny Simenon: "But no, Dad, I'm not the top."  "Here you don't know anything yet, since you've just begun the year, but at Cannes, where you were in school for two years, you were always first!"  "At year end only, but not every month," persists the boy. When I note that Johnny is rigorously honest, his father, whose look doesn't conceal his satisfaction, whispers into his pipe, "Oh yes, I'd even say that he's a Jansenist!" While coming out of the dining room, he tells us that there is also Marc, the eldest, child of his first marriage, who is already 18. "Since it's his last year before the diploma, I didn't want him to have to leave the high school at Cannes... but he comes home as much as possible, whenever he has some vacation time. And next year he'll be a student in Lausanne, in Biology." The writer is therefore a happy family father. Finally, there is Simenon's wife. She has a ballerina's slim and graceful silhouette, the regular and serious face of a Madonna, an expressive look and a charming welcome. When making the introductions, Georges Simenon said, "This is my wife... she works, while I don't do much at all!" Mme Simenon is a literary agent. She has only one client, but it is fitting that the client is also her husband. Or rather, since she wanted to be useful to him, she created this profession for herself. "It's the only way I can share in his work," she says. Denise Simenon is very much in love with her spouse. He, in his turn, is very much in love with her. And to be always together, and to also share the joy of work, she chose to take care of the distribution of his prodigious output. But she doesn't just handle contracts with publishers in the four corners of the world, adaptation rights to movies, theater, and radio  which would already seem enough to exhaust this slim and fragile-looking woman  Denise Simenon includes this work in another, more general task, a kind of goal she has set herself: to be her husband's 'guardian angel', to surround this personality  so sought-after because so exceptional  with a protective wall. And that is why anyone who wants to approach Georges Simenon, who wants to bother him under any pretext, must first address Denise. It's not that she simply guards the door  she organizes, eases, and simplifies the writer's contact with the outside world. So that he can have his mind and soul mind in peace, she is in charge of everything. "We're real morning people," says Denise. Georges descends the two flights that separate the bedrooms from the ground floor and goes to join his imaginary characters in the smoky office. Denise remains in a small room close to the bedroom, assailed by the multiple telephone calls she receives or makes, whether a conversation with the butcher to place an order for the lunch meat, or with a publisher in New York. "This morning I had seventeen calls in all," she says. There is also the mail to go through, "sometimes thirty letters," says her husband, for whom any pretext is good enough when he wants to disturb his wife's work: "I'm leaving," he says, "I just wanted to kiss you good-bye". And a few moments later, he comes back from a walk through the garden: "I'm back, I just wanted a hug." Radiant at every "bonjour" and "au revoir" of her husband, Denise recovers her serious and solemn air as soon as he turns away: "I rush to have all my time for him," she says with a smile. In the evening, after dinner, Denise and Georges shut themselves away, in 'their place'. This corner, in the immense château in which they live  thanks to the fortune that his genius has procured them, but also to her unceasing work  this haven of peace and happiness, is the little room on the third floor. While Georges chooses the pipe that he will smoke, while he looks for a good program on the radio, Denise is installed before the small secretary desk where she locates, set down on a sheet of paper, the menus for the following day. If it is a market day, and if Georges is not writing a novel, they will go together to make their purchases. But tonight, they can speak of something else. And in the first place, of themselves, of this happiness that they knew how to create and that they know well to preserve. I have a fascinating profession.. and so easy! To write a Maigret, I work at my typewriter two or three hours every morning... and for just a few days. 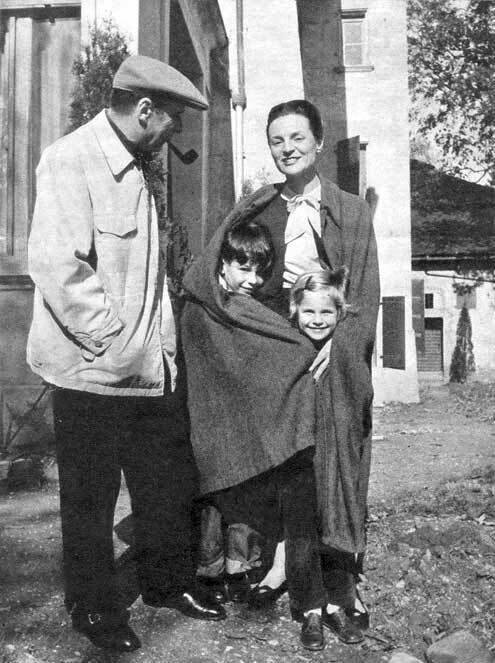 Simenon, his wife and children, get ready to leave for their daily walk in the country. 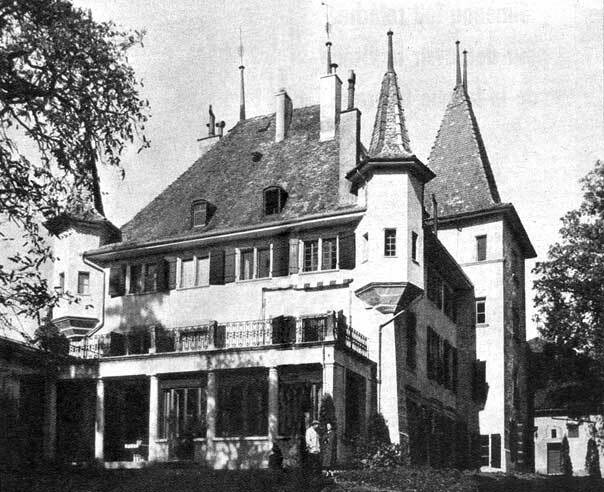 Close to Lausanne, "Commissioner Maigret" has lodged his family in an old château with turrets, that could provide an excellent setting for a detective novel.